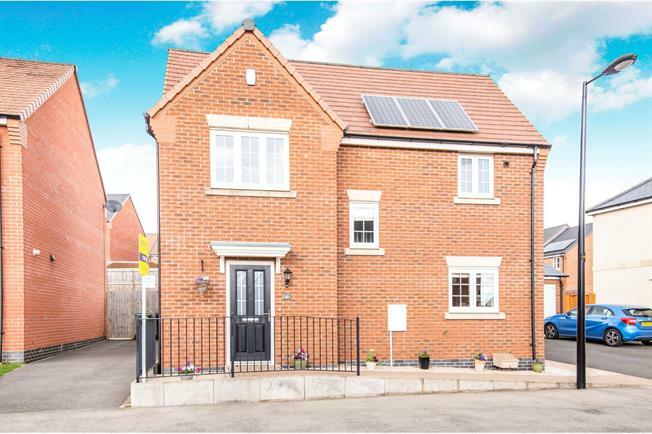 3 Bedroom Detached House For Sale in Leicester for Asking Price £260,000. A perfect opportunity to acquire this stunning three bedroom detached family home. Located on the popular Hallam Field Estate sitting on a generous plot this property is close to all local amenities and travel links, walking distance to the village centre and in good school catchment. Immaculately presented the property briefly comprises spacious hallway giving access to all accommodation, downstairs W/C, lounge over looking the garden with French doors and recently fitted with new carpets, kitchen/diner with space for all appliances also with French doors opening onto the patio area of the garden. Upstairs offers master bedroom with an en suite shower room and recently fitted with new carpets, two further double bedrooms and a family bathroom benefitting from recently new fitted carpets on the stairs and landing. Externally offers a private rear garden which has been very well maintained, two parking spaces and a single garage which you can access via the front of the property but also via a side door in the garden. This property is still under NHBC warranty and benefits from solar panels which are owned and not leased saving money each year on electric, the current owners saved roughly 175 for 2018.